Frankfort was established in 1867 when the Central Branch Railroad was being built across the county. It is in the valley of the Black Vermillion River, and the route of the Oregon Trail is a short distance to the south. 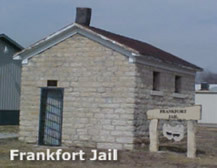 Many limestone buildings in Frankfort have been maintained over the years and are in use today. Several lovely stone and frame houses of the early 1900’s grace Frankfort’s tree-lined streets. On Highways 9 and 99. Contact Joe Ann Kurtz, 785-292-4274 or Sharon Owen, 785-292-4266. Frame schoolhouse. The first school building in Frankfort, used from 1870 until 1880. Moved to the city park in recent years and now houses a small museum. Open on request; call 785-292-4336 or Frankfort contacts. 2nd and Oak Streets. Native limestone jail, built in the 1880s. National Register of Historic Places. 1st and Locust Streets. Historic Grade School. Built in 1903 of brick trimmed with native limestone. Used for classes until 1998. National Register of Historic Places. Private property. 4th and Locust Streets. Other limestone structures of interest include several downtown buildings; Annunciation Catholic Church (1909), 5th and Maple Streets; and the Presbyterian Church (1904) and Manse, 6th and Kansas Avenue. Civil War Soldier’s Monument, dedicated in 1895. Frankfort Cemetery. South side of West 10th Street (Tumbleweed Road). Memorial bronze crucifixion, erected by a couple who lost three adult children in the flu epidemic of 1918. Mt. Calvary Cemetery. On 21st Road ½ mi north of Tumbleweed Road. Nottingham post office marker. This early post office operated out of a farmhouse from 1857 until 1869, when the post office was moved to the new town of Frankfort. On 23rd Road just south of Utah Road. Pratt steel truss bridge. Good example of the most common type of bridge construction in the early 1900’s. On the National Register of Historic Places. The steel trusses were shipped in by rail and the piers and bridge floor were constructed locally. Private property. On Sunflower Road 3/4 mi west of 21st Road.